Aerosweep Pty. 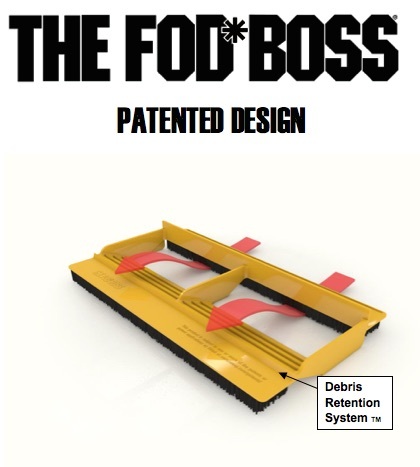 Ltd. manufactures and distributes the amazing FOD*BOSS airport and runway sweeping equipment and continues to develop this patented system for removing FOD (Foreign Object Debris) from tarmac areas since 1994. It was invented by company founder Warwick Tozer. The product has won numerous awards and continues to receive accolades worldwide. Aerosweep speed sweeping systems have significantly contributed to aviation safety worldwide, operated by airports, airlines and all major Air Forces. Aerosweep sells its products via a network of specialist dealers. 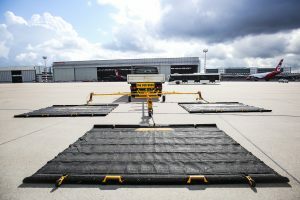 This extraordinary patented runway sweeper is the only equipment designed exclusively for collecting FOD. 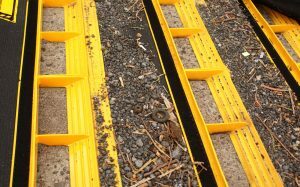 Debris such as nuts, bolts, pavement fragments, washers, rivets, stones, sand, and gravel can be collected simply and inexpensively with amazing efficiency and a pick-up rate unmatched by any other sweeper. The FOD* BOSS can be easily towed by any motorised vehicle and is perfectly suited for single person use. No special licenses or skills are required. At low speeds using a compact tow vehicle, it can be used with complete safety around parked aircraft—even up close. The FOD* BOSS has no noisy motor and is simple, reliable and breakdown resistant. The entire unit is maintenance-free and guaranteed. The FOD*BOSS is a unique and patented airfield tarmac sweeper designed to remove Foreign Object Debris (FOD) from aircraft movement surfaces with amazing speed and efficiency.There is no ‘equal’ to the FOD*BOSS system. The initial concept was invented in 1994 and consists of heavy-duty brushes that activate FOD using the force of friction, which is then collected by rows of specially designed and formulated impact resistant Aerothane™ blades to assist in the collection and retention of debris. (PAT.NO.U.S. 8,839,878,B2). The FOD*BOSS performs better than any sweeper seen before. From its high collection capabilities to its amazing speed and unrivalled efficiency, it is the ultimate FOD sweeper. This is a virtually maintenance-free tarmac sweeper capable of removing dangerous material, such as rocks, metallic or non-metallic objects, luggage hardware and even sand, that has a sweep width of 2.4m/8ft, 4.8m/16ft, and 7.3m/24ft and operates at speeds up to 50 kph in wet or dry conditions. Operating using the force of friction, the FOD sweeper works on concrete, asphalt, or smooth or grooved fine-textured spray seal. This patented sweeping system is available worldwide via a network of distributors and includes an unconditional lifetime money-back guarantee on performance and durability. 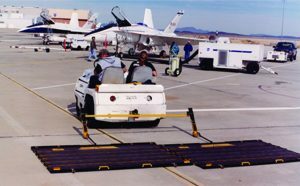 This unique speed sweeping system was designed to provide efficient, reliable FOD control at airports and military bases. The physical action of the sweeper is remarkable; each FOD* BOSS incorporates a series of tough, long-wearing brushes that activate the FOD for collection by rows of specially formulated Aero-thane scoops. 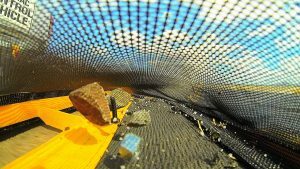 The collected debris is then trapped by a retaining mesh. No matter the substrate—concrete, asphalt, interlock paving, fine textured spray seal, smooth or grooved, wet or dry—it’s all easy going for the FOD* BOSS. 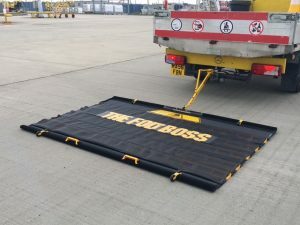 The unit does not use vacuum suction, so there is no danger of lifting pavement surfaces, even when freshly laid. It also does not retain water and works equally well in the rain. Regional Airports can now afford to have FOD sweeping equipment available 24 hours a day. 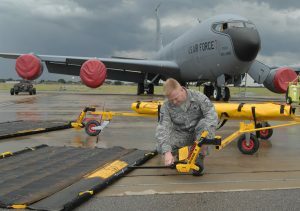 Airline maintenance facilities will find the FOD* BOSS indispensable in ensuring FOD-free hard stand areas. 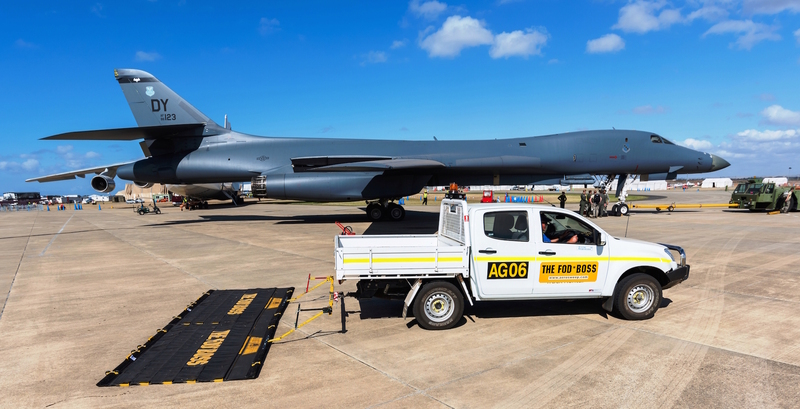 Groundforce™ Tow Hitch: A wind-resistant hitch that keeps the FOD*BOSS secure to the tarmac as it’s tracked behind the vehicle. Debris Retention Blade™: Elevator ribs move FOD up and over retaining barriers to effectively capture debris, in order to maximize retention. 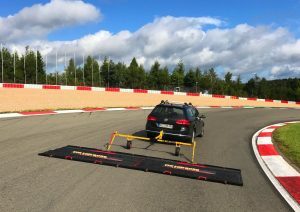 FODStop™ Barrier System: Built into capture zones, FODStop barriers help prevent debris from sliding sideways and keep debris spaced during cornering so it’s collected properly. Aerosweep also offers a duplex hitch and Triplex trailer to sweep even wider areas. By doubling or tripling sweeping capacity, customers are ensured a more effective and cost-efficient purchase.